A novel anti-inflammatory drug may discourage repeat heart attacks. Inflammation grabbed the attention of researchers a couple of decades ago as a primary culprit in the progression of cardiovascular disease. However, identifying a drug therapy that leverages this link has been more elusive. With the results of the recent Canakinumab Anti-inflammatory Thrombosis Outcomes Study (CANTOS), published in the Sept. 21, 2017, issue of The New England Journal of Medicine, it appears that the dots are finally beginning to connect. "For the first time, we have an anti-inflammatory therapy that can reduce the chance that a person who has already had a heart attack will have a repeat occurrence," says Dr. Peter Libby, a cardiologist at Harvard-affiliated Brigham and Women's Hospital. "This opens up a new field of treatment and offers hope to our patients." He is one of the co-authors of the study, which was led by his colleague and fellow Harvard Medical School professor Dr. Paul Ridker. Inflammation is part of the body's natural response to protect itself against harm. There are two types: acute and chronic. The acute type occurs when you have an injury or infection. This short-lived reaction rids the body of harmful intruders and repairs damaged cells. Chronic inflammation, on the other hand, can develop as a response to long-term exposure to unwanted substances in the body, such as toxins from cigarette smoke or an excess of fat tissue, especially around the midriff. Chronic inflammation is important to heart health because it plays a pivotal role in the development of atherosclerosis — the buildup of fatty, cholesterol-rich plaque inside the arteries. Your body perceives this plaque as foreign, so it initiates an inflammatory response to contain the damage. Chemical messengers called cytokines draw white blood cells to the area to consume the cholesterol particles and to wall off the plaque from the flowing blood. But if that wall breaks down, the plaque may rupture. The contents then mingle with blood, forming a clot that could block blood flow. These clots are responsible for most heart attacks and strokes. The more than 10,000 patients enrolled in the CANTOS trial had already suffered a heart attack. They also had high levels of C-reactive protein, a biomarker signaling bodywide inflammation (see "What your CRP test results mean"). All were taking standard heart drugs, but some also took varying doses of the drug canakinumab (Ilaris). Canakinumab was not originally developed as a heart medicine; it's a specialized monoclonal antibody used to treat a rare autoimmune disorder in children. It disrupts the inflammatory process by neutralizing a specific cytokine that is instrumental in the progression of atherosclerosis. At the end of the trial period, people who received the higher doses of the drug were 15% less likely to have experienced a heart attack, stroke, or other cardiovascular event. This held true even though the canakinumab did not lower lipid levels or affect any other traditional heart risk factor, says Dr. Libby. It will probably take months for the CANTOS results to make their way into clinical practice, Dr. Libby predicts. Canakinumab is already approved for other populations, but it has some notable side effects, including a greater risk of serious infections. In the meantime, another study is testing the effectiveness of low-dose methotrexate in cardiovascular disease. In contrast to canakinumab, methotrexate is a generic, inexpensive drug commonly used to treat rheumatoid arthritis. Results from this trial, also led by Dr. Ridker, should be available within the next few years. Research suggests that among people with normal cholesterol, those with increased CRP levels have several times the risk of heart problems compared with those who have low CRP. 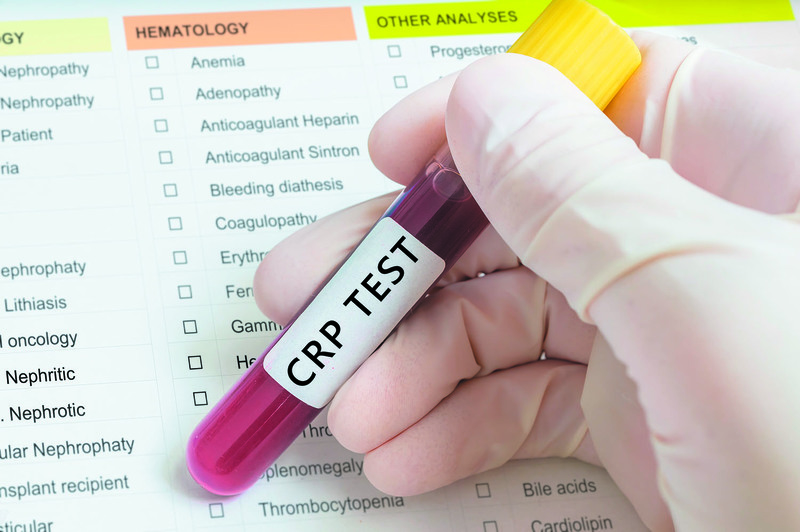 Until now, many doctors have been reluctant to recommend CRP testing as part of routine care because they believed the results wouldn't have an effect on treatment choices. However, new drug therapies that specifically target cardiovascular inflammation will open the door to wider use of CRP testing, Dr. Libby predicts.